As evidenced by the photo to the left, Hong Kong’s chief executive CY Leung is not a popular person right now. And that was before anybody found out about the millions of dollars that he pocketed in a sketchy deal. CY Leung has been in the international spotlight since late September, when pro-democracy protests reached their peak in Hong Kong. This came on the heels of China’s announcement that Hong Kong voters would be allowed to vote in the direct elections in 2017 as promised—but only for a small pool of Beijing-approved candidates. 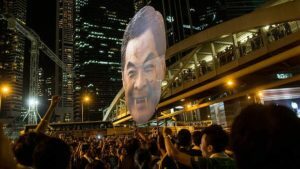 Along with protesting China’s denial of universal suffrage for Hong Kong citizens, the protestors also began calling for Leung’s immediate resignation. Now, a recent investigation by the Australian media has revealed that Leung was involved in a secret contract with Australian-based engineering firm UGL back in 2011, before Leung was elected as the top official in Hong Kong. This contract meant that Leung would receive two payments from UGL that totaled more than $7 million, and ended up being paid out from 2012 to 2013—after Leung had taken his position. What did the deal entail? The deal was dependent on a 200-year-old British firm called DTZ Holdings, of which Leung was a director and chairman of its Asia-Pacific operations until 2011. UGL was intending on purchasing this firm, and they were hoping to use Leung’s business connections in Hong Kong and mainland China to guarantee DTZ Holding’s success. The contract even promised Leung a bonus in the form of an additional 1.5 million pounds – the final total of this deal would mean that Leung received more than 5% of the purchase price of the holdings firm, while DTZ’s other shareholders were completely shut out. Now, Leung’s office is claiming that all of the dealings were above board, due to the fact that they were all conducted before he had been elected as the top official. However, the timeline itself is pretty sketchy. It goes something like this: Leung steps down as a member of Hong Kong’s executive council in October 2011, before DTZ is sold to UGL. Then, he announces his resignation from DTZ on November 24, and three days later, Leung announces that he’s running for chief executive. Then, he signs the contract in question with UGL on December 2. Leung’s official resignation from DTZ only took effect on December 4, the same day UGL acquires DTZ. This secret arrangement would never have come to light if it hadn’t been for a whistleblower that actually sent a copy of the contract between Leung and UGL to an Australian newspaper. Given that they had access to such a confidential document, it’s rumored that they may have been a high-ranking official. With this secret contract out in the open and the continuing pro-democracy movement in Hong Kong, it’s clearer than ever that everyone’s voice deserves to be heard. Even when it’s a conspiracy involving the top-ranking official in Hong Kong, a lone whistleblower can make all the difference. Having a healthy whistleblower culture in your workplace can be a great first step towards encouraging all of your employees to speak up about their concerns. An independent ethics-reporting system such as Whistleblower Security can help you along the way, even providing a 24/7/265 whistleblower hotline that will be there whenever your employees need it. Go on. Let your voices be heard.